Crisp, off-dry with apple blossom, apricot, ripe peach and pear. Great with spicy dishes! Semi sweet, with aromas of fresh flavors of fruit, yet crisp with a soft finish. Full bodied, with tropical fruit notes, apple and pineapple aromas and flavors, and a long finish. Fragrant with fruit aromas of melon, lemongrapefruit with no oak. Fruit-forward, with lemon, lime, citrus blossom, gooseberry, passion fruit, grapefruit and tangerine, balanced by a crisp acidity and a pleasant finish. Flavors of citrus and grapefruit zest with a pleasant mineral character. Balanced tropical fruit and flavors of yellow apple open up to coconut, pineapple and banana with a lingering finish of almond and spicy oak. Flavors of pear, with crisp green apple, vanilla and toasty caramel. Layers of cherry, raspberry and strawberry are complimented by oak elements and a silky finish. Briar and pomegranate fruit are followed by mocha and a hint of pepper and oak on the finish. 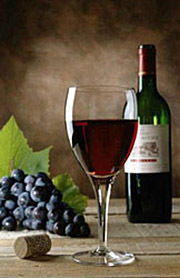 Lush, ripe, dark fruit and blueberry flavors with a touch of vanilla and nuances of French oak aging. Seductive flavors of black cherry with a hint of strawberries and dark tobacco on the finish. Balanced, with lush black cherry, plum and boysenberry complemented by soft tannins. Boasts a deep ruby color and layered notes of black cherry, plum and cola. Black raspberry and currant with notes of sweet spice, sweet tannins and a long finish. Wines may be subject to availability.